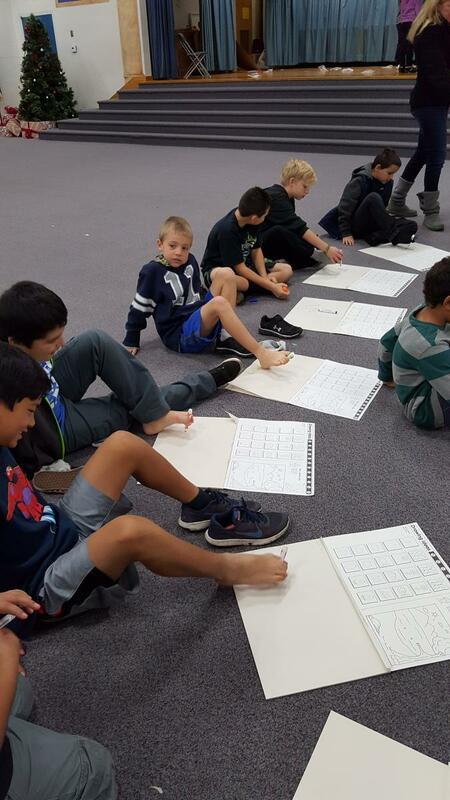 Crown Valley Elementary School students attempted to write with their feet to help teach them what life would be like without use of their hands as part of the school's Ability Awareness program. Crown Valley Elementary School students experienced firsthand some of the challenges that people with physical and neurological disabilities face during the school’s Ability Awareness program Jan.14-15. The program, organized by Parent Teacher Association special education committee Chairwoman Mercedes Wagner and President Melissa Caldwell, offered eight stations that demonstrated such challenges. At the multiple sclerosis station, for example, students’ feet were tied to restrict mobility and their vision was obstructed by special glasses. On the second day, Wagner interviewed several youths with ability challenges to show the students in the audience what their day-to-day lives are like, Caldwell said. “The students learned about some of the difficulties people go through on a daily basis, and I think as a result they’ll be more accepting and compassionate,” Caldwell said. In addition, University High School’s deaf and hard of hearing cheerleading team came from Irvine to perform a cheer routine for the students, Caldwell said.